WHEN I WAS studying history at school, I always felt there was a barrier between me and what I was reading about. The way history is presented in schoolbooks constantly reminds students that they’re observing the event from the outside. There’s a void that reduces people to statistics and sterilises events. Graphic novels remove that barrier. There’s an immediacy that draws you in right away and places you right in the centre of the event, making it ideal to depict history. While Ireland has had many important historical moments, [creative partner] Paddy and I felt that if any of them justified being told as a graphic novel, it was the Lockout. The Lockout wasn’t a story about one single person, it encompassed the entire city of Dublin and a graphic novel is the perfect medium to bring a city to life. We’ve been able to use the people of Dublin to tell the story, whether it’s a tram driver on 26 August 1913 or a hungry family waiting at the docks for the next food ship to arrive. Presenting all these different perspectives and experiences helps to transport the reader directly to 1913. To understand and fully appreciate the sacrifices made by so many people, it’s important to be able to see the squalor of the tenement slums and feel the force of the batons falling on Bloody Sunday. This project was not without its challenges of course. Paddy spent countless hours trawling through the National Archives, gathering as much photo reference as possible to ensure we were presenting the most accurate representation of Dublin possible. Certain locations, such as courthouse interiors, proved incredibly difficult but we always found a way. We found it astonishing to observe the contrast between present day Dublin and 1913 Dublin. One hundred years might seem like an eternity and while countless things have changed, it’s incredible to see how in some instances things are exactly the same. When I was in school, The Lockout only received a minor mention on the history syllabus, a small speed bump on the way to the Easter Rising and the War of Independence. This has thankfully been redressed in recent years, while both events are unquestionably crucial to Irish history, so too is the story of Big Jim. Larkin’s such an important figure in Irish history because of the enormous impact of his work and his unwavering commitment to workers’ rights. Like him or loathe him, no one can deny the staggering change he brought about in Ireland. Particularly in recent times, you only have to turn on the news to see the influence of the 1913 Lockout one hundred years later. In 1913, Dublin was a third world country where the workers of Dublin had no voice. Now 2013 is not even halfway through and already the workers of Ireland have stood up for their rights on countless occasions, the current Bus Éireann strike in particular has an eerie resonance to the Lockout. Each day, the news is dominated by reports of industrial action around the country. Each day, the workers of Ireland remind us that they have a voice and they owe that voice to James Larkin. He galvanised workers in a way that had never been done before and has ensured that they will never allow themselves to be so mistreated ever again. That idea’s going to be with us for a long time to come. It’s also appropriate that the Lockout is told through a graphic novel because Larkin himself was greatly aware of the power of comics. Throughout the Lockout, he and William Martin Murphy attacked one another viciously through the political cartoons in Irish newspapers. Nowadays, with schools placing an increasing emphasis on visual learning, our comic provides a great opportunity to educate people about a landmark event in Irish history as well as introducing the next generation to the Labour Leader. Email “Column: Here's why I decided to make a graphic novel about Jim Larkin ”. 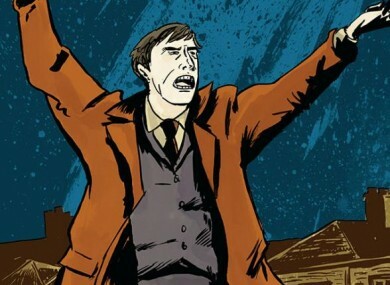 Feedback on “Column: Here's why I decided to make a graphic novel about Jim Larkin ”.